97 Cook Street was designed and built in 1911 by John Avery, who intended it to be his own residence. It is a somewhat unusual design: an Arts & Crafts house made of concrete block rather than the typical wood and stone used in Arts & Crafts houses of this period. It was Heritage Designated on the City of Victoria Heritage Building Registry in 2014. John Avery also built 139 Cook Street in 1911. 97 Cook Street is a classic early 20th century Craftsman Bungalow design but it is unusual in its use of building materials. 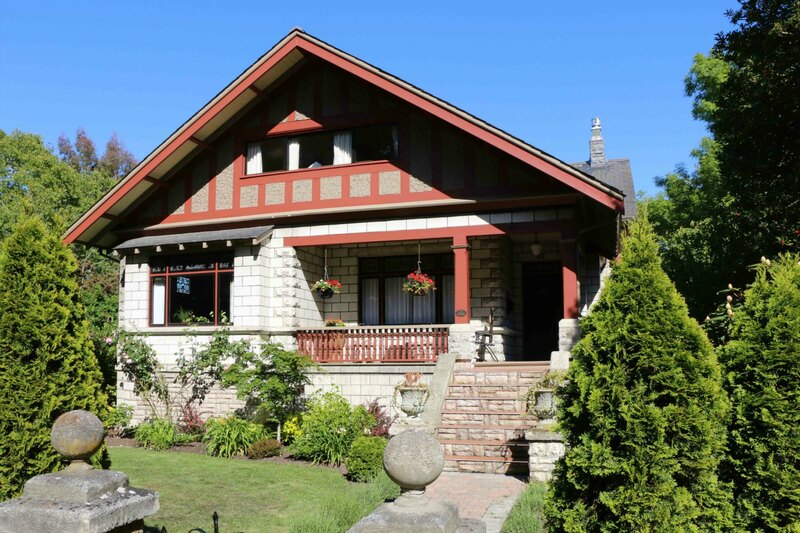 Rather than using the wood construction typically used throughout Craftsman Bungalows, this house is built of concrete block and “artificial stone” of various textures and colours. Note also the original concrete gate and fence around the property. 97 Cook Street was designed and built in 1911 by John Avery, who also designed and built 139 Cook Street. John Avery apparently intended it to be his own residence but he lived here less than a year before selling the house to Captain William Henry Logan (1861-1927) and Elizabeth Martha Logan (nee Bury, 1864-1945). Elizabeth Logan lived here until her death in 1945. This house has always been an owner occupied single family residence. 97 Cook Street was Heritage Designated on the City of Victoria Heritage Building Registry in 2014.